Just one "fly" from Narita Airport will take you to the fascinating old days! A venerable shrine which was built more than 2,000 years ago. 2 million or more people will visit in the place. People enjoying the cherry blossoms in spring and the changing leaves are beautiful in autumn. 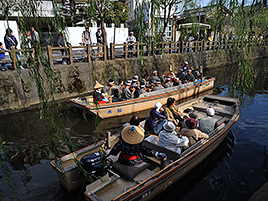 Sawara that propers by using water transportation.People took the culture of Edo,This place was selected to "Important, tradition Groups of buildings preservation district" for the first time in Kanto in December,1996. You time-travel and it’s possible to be flooded with nostaligia. A small boat trip where you can enjoy the scenery along Ono river that runs through the center of Sawara.The bridge which spans an embarkation place is called a jya-jya bridge. This is water drops from a bridge every 30 minutes,so it’s famous. Each of the museums exhibit their own inner structures or traditional artifacts. A memorial dedicated to Tadataka Inoh.He is Known for completing the first map of Japan created to using modern surveying techniques.His exhibited tool kinds were designted as national treasure in 2010. The festival is called one of the Kanto three major float festivals, and has the tradition of about 300 years in “Grand festival of Sawara” summer and autumn festival. The dynamism of these festivals can be experienced at “Dashi Kaikan”,two of the twenty-four floats shown up close.